A teaching assistant claimed a 'proper education' would mean there will not be 'any Tories because we'll have brought our kids up properly' today. 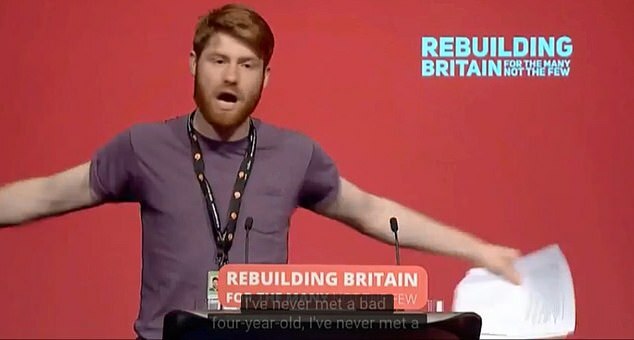 Sion Rickard made the incendiary claim during an education debate at Labour's conference in Liverpool today. The party member from Aberconwy said he had never met an 'evil' four year old in his classroom. He said better education would end crime, social issues - and the Tory party. Mr Rickard said: 'I've never met a bad four-year-old. I've never met a four-year-old that was evil. Tory MP Nigel Evans told MailOnline: 'It's frightening to think that this guy is let loose in classrooms. There was clearly a malfunction in his own education which seriously needs investigating. 'Any thorough education of youngsters today giving a proper grounding in economics and what happens if you borrow massive sums of money with no hope of paying it back resulting in misery should be the order of the day. 'I trust his school will be taking the children on the school holiday to Venezuela in order to see first hand what happens when socialism gets it badly wrong. 'The incident is the latest example among pro-Labour teachers of anti-Tory abuse in schools. Last year a war hero turned Conservative MP revealed his teenage son's teacher stood up and told his classmates not to talk to him because his dad is a Tory. Bob Stewart, who served as an Army Colonel before he joined the Commons, said four of his sons have been 'hassled' at school because of his parliamentary career. But he said the abuse reached a new low during the General Election when his 13 year-old son's teacher told his classmates to shun him because of his father's political beliefs.In her main speech, shadow education secretary Angela Rayner vowed Labour will scrap the free schools programme and end academisation. She described the academy system as 'not fit for purpose' as she pledged to end the 'forced conversion' of schools, saying she would instead focus on delivering 'what works' to get the best results for pupils. She criticised the 'fat cat' salaries of some executives at large academy chains, and said local communities have been shut out of decisions affecting schools in their area.